Is it time to start making your own records? DRC: way cooler than a printer. Although it's hardly selling in massive quantities, reports indicate that demand for vinyl is on the rise again, and its medium-term future as a niche format seems assured. How do you go about releasing your music on vinyl, though? 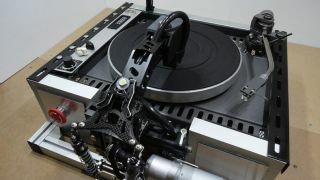 Well, if you back the Desktop Record Cutter (DRC) project to the tune of $7,000 AUD, you may well be able to start cutting your own records at home (smaller donation options are also available). Its developers say: "The DRC is automated using precision engineered technology for ease of use [for new cutters], whilst allowing custom control, upgrades and modification for the experienced engineer." You can find out more on the Desktop Record Cutter Kickstarter page; at the time of writing, more than three times its $10,000 AUD funding target had already been pledged, so we're assuming that the DRC will be going into production. Developer Machina.Pro says that it hopes to sell the product for around $6,500 AUD once it comes to market.